How Are EU Migrants Represented Across the UK Workforce? As the EU Referendum approaches, we’re continuing our blog series on what the data collected about the EU can tell us about how being a member state affects the UK. Following on from our recent article about the movement of people within the EU and how this compares with migration to and from the rest of the World, in this post we take a closer look at migrants in the UK in order to understand how they are represented across the nation’s workforce. Each month the Office for National Statistics (ONS) releases data on the UK Employment and Labour Market. These data include quarterly results from the Labour Force Survey (LFS), a survey of the employment circumstances of the UK population. It is the largest household survey in the UK and provides official measures of employment and unemployment. We’ll explore these data below and the picture they can give us of the UK workforce in the context of our membership in the EU. Despite EU nationals making up only a third of all migrants in the UK, the ONS LFS data show that EU nationals constitute 64.3% of the migrant workforce. Based on the most recent ONS release on 18th May 2016, for January to March 2016 there were estimated to be 31.5 million people aged 16 or over in employment in the UK. As shown in Figure 1, of these workers (excluding 4.6 thousand with an unstated nationality), approximately 89.4% were UK nationals and 10.6% non-UK nationals; 6.8% being EU nationals (from one of the 27 EU member states excluding the UK) and 3.8% being from the rest of the World. The proportion of all people working in the UK accounted for by UK nationals has decreased by just over 7 percentage points over the last 20 years, from 96.5% in the first quarter of 1997 to approximately 89.4% in the same quarter of 2016. This is accounted for by a rise in the proportion of the UK workforce made up of non-UK EU nationals, from 1.7% to 6.8% over the same period, and a smaller increase for non-EU nationals, from 1.9% to 3.8%. Hence, the increase in the proportion of non-UK nationals working in the UK mainly reflects the admission of several new member states to the EU over this period. 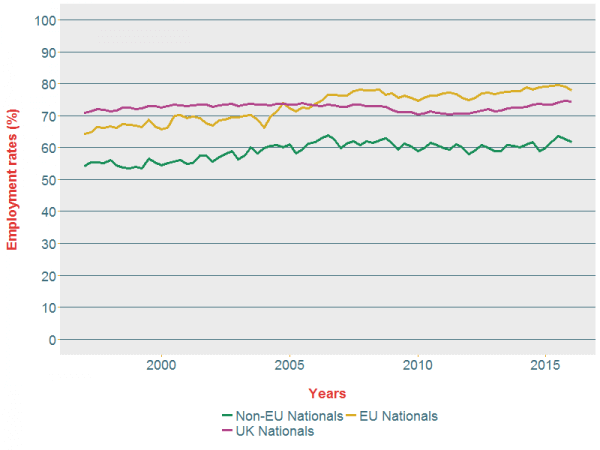 Looking at the numbers of people working in the UK by nationality (shown in the left-hand plot in Figure 2), we can see that there has been a steady increase in the number of non-UK nationals from EU countries over the last decade, from approximately 758,000 for January to March 2006 to 2.15 million for the same period in 2016. Whereas, since early 2009, the number of non-UK nationals from outside the EU working in the UK has been broadly consistent; at an estimated 1.25 million for January to March 2009 and 1.19 million for the same period in 2016. If we consider the estimates for people born abroad, the picture is somewhat different (see right-hand plot in Figure 2). The numbers of people working in the UK who were born outside the UK are generally higher because the estimates for people born abroad working in the UK include some UK nationals. There is a larger discrepancy for non-EU nationals as foreign residents who are non-EU nationals are likely to have a greater incentive to apply for citizenship of the UK than those who are EU citizens and therefore already benefit from rights more comparable to those of UK nationals. Figure 2: Quarterly UK employment levels by non-UK nationality (left) and non-UK country of birth (right), split by EU and non-EU, for people aged 16 and over (not seasonally adjusted). Estimates since the start of the time series are based on the current membership of the EU. Some press agencies have used these ONS figures on the numbers of people in UK employment over time to make comment on the proportion of new jobs that have gone to non-UK nationals in different quarters. However, as this BuzzFeed article discusses, this could be misleading as these numbers don’t tell us how many new jobs there were nor what proportion have been filled by UK and non-UK workers. All we know is the net change in the number of people in employment, which will include some who have dropped out of work and some who have gained employment – see this article from independent, non-partisan, fact-checking charity Full Fact for a detailed explanation as to why proportions of net changes don’t generally make sense. The ONS provides a statement to this effect with each release of these data but, despite this, various major news networks have reported the figures incorrectly. Working age, non-UK EU nationals have a higher employment rate than both non-EU nationals and UK nationals, at 78.0% compared with 61.7% and 74.4%, respectively. If we consider the levels of employment as a proportion of the total number of UK and non-UK nationals of working age in the UK, we can also understand if and how the rates of employment might differ. These data are visualised in Figure 3, and we can see that for January to March 2016 (the most recent data available) the employment rate was highest for non-UK EU nationals at an estimated 78.0%, compared with 74.4% for UK nationals and a somewhat lower rate of 61.7% for non-EU nationals. The EU rate overtook the UK rate in January to March 2006 and has consistently remained higher in the following decade. Figure 3: Quarterly UK employment rates by UK and non-UK (EU and non-EU) nationality, for people aged 16 to 64 (not seasonally adjusted). Eurostat also publish quarterly and annual data from the European Union Labour Force survey (EU-LFS), which brings together European household sample survey data on labour participation collated from national surveys. Using the most recently released, detailed results (from 26th April 2016), we can explore the employment rate further and, in particular, see how the rates break-down by gender. We can compute the employment rate as the ratio between the employed population and total population in the relevant age/gender group, excluding those with unreported citizenship. Looking at the last quarter of 2015, it appears that the lower UK employment rate for non-EU nationals is largely driven by a lower activity rate of foreign women from non-EU member states. The female employment rate for non-EU nationals was 51.5%, approximately 17 percentage points lower than for UK nationals (68.9%) and just under 22 percentage points lower than for non-UK EU nationals (73.0%). Whereas for men, the difference was less marked with non-EU nationals estimated to have an employment rate (72.6%) just under 6 percentage points lower than UK nationals (78.3%) and 12 percentage points lower than for non-UK EU nationals (84.6%). Figure 4: 2015Q4 UK employment rates for people aged 15 to 64 by UK and non-UK (EU and non-EU) nationality, and gender. In 2008, Eurostat carried out some more detailed research on the labour market situation of migrants in the EU, which was released as one of a series of ad-hoc modules covering a variety of topics. In their report (see page 82), Eurostat described how the economic activity rates of women were found to be lower when there were dependent children in the household. Across the EU, similar activity rates were recorded for foreign women and female citizens of their residing country without children. However, the activity rate dropped for foreign women with one dependent child in the household but remained relatively stable for female citizens of their residing country. This effect was found to be stronger for non-EU citizens. The activity rate gap also widened with the number of dependent children in the household. This may help to explain the differences in the female employment rates discussed above. Similar to UK nationals, Public admin., education and health is the largest sector in which EU14 nationals work. In contrast, workers from newer, A10 member states, are more likely to work in Distribution, hotels and restaurants as the most popular sector, and have the highest rate of working in Manufacturing. In Which Industries do Migrants Work? Roughly 10.6% of the UK workforce is made up of non-UK nationals, but what sorts of jobs are filled by migrants compared with UK nationals? Ad-hoc, user-requested data available from the ONS (based on 2014 Annual Population Survey datasets), show how the UK workforce is broken down by industry sector for UK and non-UK nationals (see Figure 5). The data for non-UK nationals are available split by the newer, EU14 member states (Austria, Belgium, Denmark, Finland, France, Germany, Greece, Ireland, Italy, Luxembourg, Netherlands, Portugal, Spain and Sweden), the older A10 member states (Czech Republic, Estonia, Hungary, Latvia, Lithuania, Poland, Slovak Republic, Slovenia, Bulgaria and Romania) and rest of the World countries. Figure 5: 2014 UK employment by industry sector for UK and non-UK nationals, split by EU14, A10 and Rest of the World (RoW) countries. Public administration, education and health is the largest sector for UK nationals (30.8%), EU14 nationals (27.6%) and rest of the World nationals (28.1%), but only the fifth largest for A10 nationals (11.1%). There is clearly variability in the sectors in which EU nationals from different countries work within the UK. For A10 countries, the largest industry sector is Distribution, hotels and restaurants (27.6%), followed by Manufacturing (19.3%). The percentage of UK nationals in employment in Manufacturing in the UK is much lower (9.6%), similarly for EU14 nationals (7.7%) and rest of the World nationals (6.7%). Of the different nationalities, EU14 nationals have the highest proportion of their UK workforce in Banking and finance (23.4%), which is their second largest sector, compared with citizens from the UK (16.6%), A10 (13.1%) and rest of the World countries (18.5%). Non-UK EU nationals make up at least 4.1% of FTE workers & 8.6% of FTE doctors in the NHS Hospital & Community Health Service. The potential effect of leaving the EU on the NHS workforce has been a concern raised by those campaigning to stay in the EU. Here we look at the data available from the Health and Social Care Information Centre (HSCIC) on the nationality of the workforce in the NHS to help understand what the possible impact could be. Figure 6 below shows the full time equivalent (FTE) number of workers in NHS Hospital & Community Health Service (HCHS) jobs for September of 2009 to 2014. Figure 6: Number of full time equivalent workers in the NHS Hospital & Community Health Service in September for 2009 to 2014, stacked by self-reported nationality, grouped into UK nationals, non-UK nationals (EU and non-EU) and unknown (overseas territories are included as non-EU nationals). The total appears to have remained relatively stable at around 1.05 million FTEs over this time. Within this, there appears to have been an increase in the number and proportion of FTEs filled by UK nationals, from 731 thousand (69.8%) in 2009 to 847 thousand (79.6%) in 2014; and a corresponding increase for non-UK EU nationals, from 25.5 thousand (2.4%) to 43.9 thousand (4.1%). However, it is important to recognise that there are many NHS staff records, upon which these figures are based, that do not contain nationality data, either because someone chose not to specify or was not asked their nationality. There has been a notable decrease in the number of records for which the nationality was unknown, from 217.0 thousand (20.7%) to 105.7 thousand (9.9%), and this has an impact on the interpretation of these figures. It is not possible to say whether the unknowns are made up of similar proportions of the different nationalities nor whether the change in the proportion of unknowns in driven in equal measure by changes in reporting across the constituent nationalities. Therefore, the increases in the FTE numbers for UK nationals and non-UK EU nationals could simply be due to the increase in the completion of the nationality field over time in the administrative system from which this information has been derived. We can say however, that the majority, at least 79.6 % (as of September 2014), of FTEs are filled by UK nationals. As discussed above, these data are only for NHS workers in the HCHS, the nationalities of GPs and other primary care staff, for example, are not recorded. NHS HCHS jobs include non-medical staff, such as infrastructure support roles. 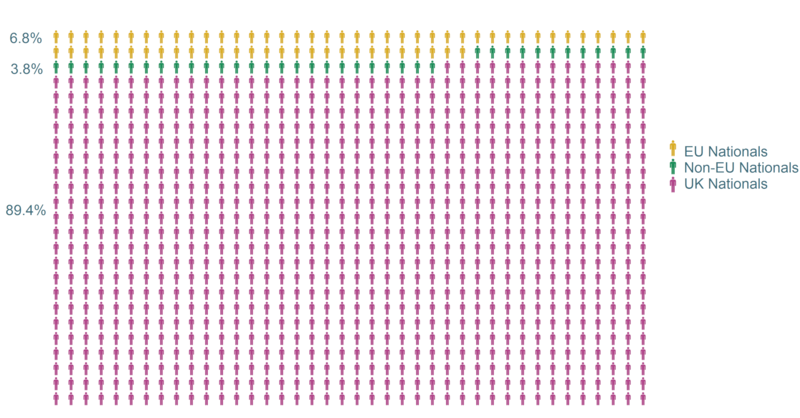 If we look at the number of FTEs only for doctors (including locums), the picture is somewhat different (see Figure 7). Figure 7: Number of full time equivalent doctors (including locums) in the NHS Hospital & Community Health Service in September for 2009 to 2014, stacked by self-reported nationality, grouped into UK nationals, non-UK nationals (EU and non-EU) and unknown (overseas territories are included as non-EU nationals). Whereas the total FTE figures remained flat, there has been an increase (+8.7%) in the number of FTE doctors in the NHS HCHS between September 2009 and 2014, from 98.1 thousand to 106.6 thousand, respectively. At least 69.3% of FTE doctors are UK nationals (as of September 2014), however, a higher proportion of these roles are filled by non-UK nationals compared with all NHS HCHS roles. At least 8.6% of FTE doctors are EU nationals and 15.5% non-EU nationals. This is due to a higher proportion of non-UK national FTEs in NHS HCHS roles being doctors (21.0% for EU nationals; 24.4% for non-EU nationals), compared with the percentage for UK nationals (8.7%), as shown in Figure 8 below. Figure 8: Proportion of FTEs (in September 2014) that are NHS Hospital & Community Health Service doctors, by self-reported nationality, grouped into UK, non-UK (EU and non-EU) and unknown (overseas territories are included as non-EU nationals). Despite EU migrants making up only approximately a third of all migrants in the UK (as discussed in our recent post: EU Freedom of Movement), the ONS LFS data show that EU nationals constitute 64.3% of the migrant workforce in the UK. The lower UK employment rate for non-EU nationals appears to be largely driven by a lower activity rate of foreign women from non-EU member states, which is not the case for non-UK EU nationals. Similar to UK nationals, Public administration, education and health is the largest sector in which non-UK EU nationals in the UK from the EU14, original member states work. In contrast, workers from the newer, A10 member states are more likely to work in Distribution, hotels and restaurants as the most popular sector, and have a higher rate of working in Manufacturing compared to UK, EU14 and non-EU nationals. Focussing on the health sector in more detail, data from the HSCIC reveal that non-UK EU nationals make up at least 4.1% of the FTE number of workers in the NHS Hospital & Community Health Service. However, a higher proportion of non-UK national FTEs in NHS HCHS roles are doctors compared with the percentage for UK nationals, and at least 8.6% of FTE doctors in the NHS HCHS are EU nationals. These figures could be used by those who are campaigning to leave the EU who argue that Britons are losing out to foreign workers taking their jobs. However, on the other side of the debate, concerns have been raised as to whether EU citizens working in the UK would meet work visa rules in the case of the UK leaving the EU, which might leave sectors such as manufacturing or the NHS understaffed and have a negative impact on the UK economy. Aside from the data reported here, there are a number of wider issues that should be considered in the context of the UK workforce and our membership in the EU. The Government, which is campaigning for the UK to remain in the EU, argues that being in the EU makes it more attractive to invest in the UK, leading to more jobs. Furthermore, a substantial number of employment rights (such as the legal limit on the number of hours employees can be required to work, and prevention of employers discriminating against workers who are disabled, for example) have their roots in EU legislation and there is the potential for many of these rights to be lost should the UK leave the EU (depending on negotiations on the UK’s subsequent relationship with the EU). However, leave campaigners also argue that being bound by EU employment rights legislation is damaging to the UK economy, imposing substantial costs on employers, and that there are already many employment-related issues that are not subject to EU legislation (e.g., the National Minimum Wage is a home-grown policy). As with many of the issues surrounding the EU referendum, we cannot say with certainty what the impact on the UK workforce will be if the UK left the EU. Forecasting migration and employment is very difficult and the policies that would follow a vote to leave the EU are unknown in advance.